Well crap most of the guys I see riding anyplace even in small stuff aren't really surfing the waves, especially when the waves are all jumblaih. It's not easy to really surf waves unless they're clean.....and even then most folks (me included) have a tendency to rely on the power of the kite rather than depowering/drifting and using the wave only. I sure wouldn't expect anybody to surf Mavs of any size and get into critical sections when it was all crapped out like that. Sure as hell have nobody around to pull your fat out of the fire if anything goes wrong. Even some of the cleaner places reffed down south can do a pretty good hold down when they're "just" double overhead. I had some of that surfing a couple of weeks ago when some sets unloaded on me and broke my leash......no fun and pretty scary swimming in that stuff even if you know what you're doing. All true indeed. 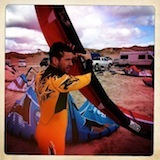 Even with 20 years of surfing experience I tend to rely on the kite for power. However... Actually riding the wave is something to strive for. I certainly do. Just trying to push the performance curve forward. So wait, the guy in the video is scsurfer? I was riding Mavs earlier that day. The wind was super sketchy and the waves all over the place... But what you see in that video is really riding Mavs on a very windy 15 footer day. Not the best conditions for Mavs anyway. The peak was breaking to close to the rocks that that's why he is riding more the shoulder. That wave is like no other and capturing it on video from shore or with the GoPro doesn't give you the right perspective. I've been out there with Jeff a couple of times and had several other sessions with Fred and another kiter or two. I can assure you that I was the one riding the shoulders and avoiding the bowl like the plague. Jeff charges the pit whether he's on a kite or a surfboard. That's especially impressive since he's a goofyfooter and rides out there backside. One problem I see with this video is that good quality photos or video is very difficult from the bluff in the afternoons. It's hard to get a real perspective on where he's actually riding. Also, it looks like a small day, so the wave actually moves in really close to the rocks (I'm not sure I'd even really consider that Mavericks; some surfers call that inside wave "Phlegmballs"). It makes sense to be riding a little out in front or on the shoulder on the smaller days. In any case, when the wind is blowing 20+, it's really bumpy out there. The speed of the wave and size of bumps makes using a regular kite directional nearly impossible. A heavy tow-in style board is definitely the way to go. This place is completely different than anywhere else. Even if you can handle big Scott's, you haven't touched the speed, power and intensity of a real day at Mavs. Aside from the wave, you are definitely part of the food chain. On one of my sessions last Spring, a surfer got bumped. I knew something was up when all 15 surfers huddled together in a pack and paddled in as a group. Oh, and getting out there and back to a safe landing ain't really easy, either! First downwind stop is the Jetty, the second is several miles across open ocean to a beach in HMB somewhere. Ok first off, I'm so stoked that there are guys on this forum who have kited Mavericks. Thanks for speaking up. You both did a good job of explaining what is like out there. I notice that in the vid, Jeff launches from what looks like a harbor. How long does it take to get from the launch site to Mav's? Any difference in wind strength between the launch site and Maverick's? Not that I am going there but where is this launch site? I noticed in the vid that there were surfers dropping in on waves that Jeff was riding. What's the vibe out there, are the surfers ok with kiters being out there as well? Do most of the surfers clear out when the wind picks up? Do windsurfers ever show up? Everyone talks about Waddell, is mavericks windy like Waddell? Like in the spring does it go off all the time? Have you crashed at mavericks? And if so what happened? Sorry for all the questions. I can only imagine him launching from here, which seems sketchy because wind would be super light inside the harbor on a NW. Am I wrong? Come on guys, are you implying that there might be some drama queens here? Say it isn't so.